Trypeta immaculata (Macquart, 1835); White, 1988: 63. Handbk ident. Br. Ins. 10(5a): 24, 40. 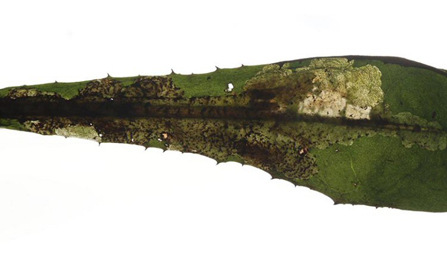 Leaf-mine: The mine begins with a very narrow full depth corridor, that ends upon the midrib. Subsequently a broad corridor, or rather an elongated blotch, is made overlying the midrib; from here broad, lobe-like extensions are made into the blade. Frass in discrete grains. Secondary feeding lines conspicuous. The larva is capable of leaving the mine and restarting in a new leaf, in which case the association with the midrib may be lost. Pupation after vacation of the mine (Bladmineerders van Europa). Yellow; anterior spiracle openings arranged in large arcs, not elevated on a fan-like structure; posterior spiracles each with a central opening larger and more raised than the lateral openings (White, 1988: 63). Comments: Leontodon autumnalis is treated as Scorzoneroides autumnalis (Autumn Hawkbit) by Stace (2010). Time of year - mines: September-October. Time of year - adults: May-June, the following year. Distribution in Great Britain and Ireland: North-east Scotland (White, 1988: 63), Perthshire (Craighall Gorge, Blairgowrie; Romadie Wood, Bridge of Cally, Den of Riechip, Butterstone) (Bland and Rotheray, 1994), Warwickshire (Alvecote) (Robbins, 1991); Caernarvonshire, East Ross, East Sutherland, Kirkubridghtshire, Mid-east Yorkshire, Mid Perth and North-east Yorkshire, South-east Yorkshire, West Lancashire and West Ross (NBN Atlas). Also throughout Ireland (White, 1988: 63). Distribution elsewhere: Europe, except Mediterranean area (White, 1988: 63), including The Netherlands (Bladmineerders van Europa) and Belgium (Leclercq and de Bruyn, 1991). See also Pape & Beuk. See also Fauna Europaea.